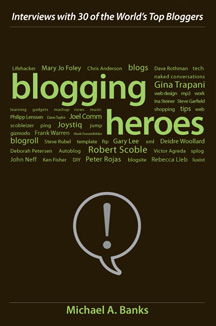 Blogging Heroes is Michael Bank’s compilation of biographies and interviews with 30 of “The World’s Top Bloggers”. Included in the list are bloggers from such well known sites such as BoingBoing, Engadget, Ars Techinca and PostSecret. While not all the bloggers covered are quite as famous as those I’ve just cited, more than half have been ranked in the top 100 blogs (according to technorati.com). In 2007 Banks conducted these interviews via telephone interviews with the goal of finding out “how they got started, why they are successful, and how other bloggers might emulate them”. The book is broken down into 30 chapters (one blogger per chapter) and the format is consistent: he starts with a brief biography regarding why the blogger is notable, followed by a straight dialogue style Q&A session, and finally a list of bullet points highlighting the blogger’s advice. A central theme that almost all of these bloggers bring up: have something unique and interesting to say. Mark Frauenfelder of BoingBoing elaborates, “New bloggers should not concern themselves with trying to be the first to report on something…what’s easier, and better, is to have something interesting to say about news.” In the next chapter influential tech blogger Robert Scoble echos a similar sentiment followed with some helpful tips. He admits that while it is important to stay up to date and follow other blogs (Scoble confesses that he looks at an average of 700 blogs each day), new bloggers need to be “more thorough” and focus closer on one topic. Scoble believes that the best way to distinguish yourself from the crowd is to be an expert in a niche rather than trying to be the authority on everything. One of the more enlightening chapters includes Bank’s interview with Chris Anderson, editor in chief of Wired magazine and author of The Long Tail: Why the Future of Business Is Selling Less of More. Anderson blogs for a different reason than most: “Blogging is a way to make myself smarter.” In the two years leading up to the release of The Long Tail, Anderson used his blog (longtail.com) as an open source research project where he essentially wrote the book in public. Anderson tells his story, “There were some people who thought that I was giving away my ideas”, but “what happened was that the Long Tail blog established quite a large readership, which helped me with the research.” It’s first-hand stories like Anderson’s that make Blogging Heroes an excellent inspiration for all bloggers. The lack of a common story binding the chapters gives the impression that the interviews in Blogging Heroes would have been more engaging as separate posts on Bank’s blog. If the content had been organized as such, or even as a how-to for bloggers book – with supporting quotes and stories from “The World’s Top Bloggers” – it would have been more helpful and enjoyable to read. Instead, I found myself gravitating to the bloggers whom I myself follow, and felt the pages grow heavier somewhere after interview #16 realizing there weren’t any other bloggers I cared to read about. The most alarming problem is that Bank’s didn’t follow his own book’s advice: have something unique and interesting to say. If that were the case he would have done a better job editing the book which includes countless repetition of the same bits of advice. Adages such as “Use your own voice” and “Don’t worry about SEO” may be beneficial the first time, but start to feel like those pestering testimonials that some companies will use to convince you about how great their product is. Ultimately, there are some interesting stories and useful advice to be found in Blogging Heroes. I think it is well suited for anyone who is currently blogging or thinking about starting a blog. Since it’s a quick read, and feels more like a long magazine rather than a novel, Blogging Heroes may be better suited for a hour of browsing at the local library.